Kristin teaches three ball positions for your full swing, depending on what club you're using. That may sound different from what I teach -- I position the ball under my hands -- but bear in mind that, as the clubs get longer, my arms have to reach out a bit and that straightens my trailing elbow. And as that happens, my hands move a bit more toward the target as the clubs get longer. Wedges: Ball in the center of your stance. Driver: Ball just off your lead heel or lead instep. All other clubs: Ball is slightly left of the center position. And she shows these positions using a couple of golf clubs to mark your aimline and your ball position. This is a good tactic to use during your own practice, to help you visualize how the actual ball position looks when you're standing over it and not looking at it from the front, as you are when you watch this video. One last thought: You may think this setup with the two clubs is a reasonably recent invention, perhaps since Hogan really started focusing on mechanics. 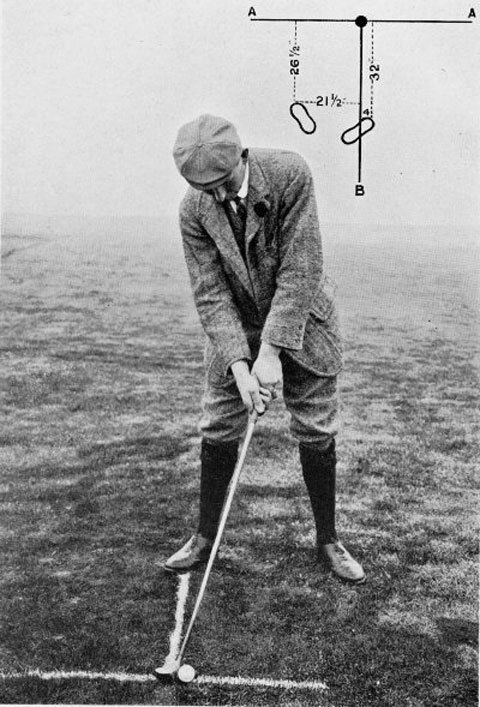 But here's a photo I posted in a past post about Harry Vardon's method for playing a draw. See anything familiar? That line drawing in the upper right-hand corner -- and the chalk lines drawn on the ground -- are doing the exact same thing as Kristin's clubs. This is a time-honored method of visualizing ball position, and you should make use of it too.